It seemed that Cuba and the United States had corrected their dispute. The visit of Barack Obama, the Democrat US ex-president, the numerous photos with Raúl Castro, president of Cuba, during a baseball game as well as the ephemeral presence of the North American leader in one of the favorite TV programs of the Cubans, provoked the investing temptation of both countries. The North American tourism in the island began to reclaim its space that by their own right they had left to the mercy of Canadians, Germans and Spanish. In a short time, the economy of the nation based on tourism began to recover and the old differences seemed to be stored in a trunk. However, the dispute that seemed to stagnate with the new good relationships floated again as a life jacket only that this time it was not to help any alleged drowning. On the contrary, to undermine the island's economy and retake the old political quarrels was the promise of Donald Trump, who, backed by, Senator Marco Rubio, both members of the same party, promised the Cuban exiled population in Miami to intensify the policy toward Cuba. Among the actions of this year and as part of the statements of Donald Trump in his speech on the State of the Union, his country escalated the sanctions against the "communist dictatorship" of Cuba, to which subversive actions and subsidy plans to encourage the muted Cuban opposition were added, for instance, the creation this year of an operative group in Internet headed to foment subversion against the Caribbean nation. As is known, connectivity and access to Internet content is one of the Cuba’s heels of Achilles; hence, the advisers of the president had the task to throw the poisoned dart precisely towards that goal. On the other hand, Donald Trump has shown that he has not left alone the Cuban people residing in the United States or those who want a change in the island, approving a 20-million-dollar budget for the execution of destabilizing actions within Cuba. Although it seemed that the turn in the policy given by Obama would remain with the current administration Trump eliminated the budget destined for Cuba; a little bird whispered in his ear and in June of 2017 he announced a new policy based on hostility and interventionism. As in previous years, USAID has received funds to continue the destabilizing programs in the country and to "maintain" an opposition that, far from being a true dissidence, is a parasite housed in the US state budget and that so far and for more than 50 years they have not shown any political force. Perhaps the greatest dissident and destabilizer in the island has been Barack Obama, who blinded Cuban people with the "prosperous" model of the United States. However, despite the fact that the State Department has the portfolio tightened due to the cuts of the current US president under the promise of change and the promotion of democracy, a group of Cubans live luxuriously in Miami and in different parts of the largest of the Antilles. Since 1996, the United States subsidizes the Cuban opposition with public funds. 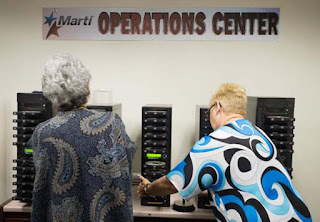 Since 2009, the Obama’s former administration recommended 20 million to these interventionist programs that continue to be granted like the cases of Radio and Television Martí, which are broadcasted but few Cubans have heard any of their transmissions, as part of intelligence programs and destabilizing activities. The anti-Cuban congressmen are said to have influenced the Trump administration so that the financing of its mercenaries in Cuba and the various counterrevolutionary projects was not cut. In addition to these attempts in the diplomatic arena, the United States has tried to blame Cuba for alleged sonic attacks that have not yet been proven to happen; however, they hit the Cuban government that saw the United States find the pretext to revert the situation. The United States continue to consider Cuba as a benchmark of Communism and the anti-hegemonic model they propose. Therefore, none of the administrations after the triumph of the Cuban Revolution in 1959 gave up in the effort to overthrow the authoritarian and anachronistic model proposed by the island. Likewise, the Caribbean people are fundamental allies in the region of two great powers: China and Russia ones that since the Soviet years have provided Cuba with technologies and knowledge.